Dental implants are the most cutting-edge therapy available for the replacement of missing teeth. To begin the implant process, a metal post is surgically positioned into the jaw. This post will act as a permanent "root" for the implanted tooth. Once it is in place, the surrounding bone and tissue need time to heal before a replacement crown is placed. 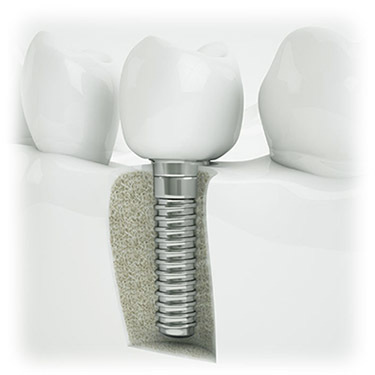 After an implant is placed, the restoration is completed with an implant crown. While implants are typically more expensive than other methods of tooth replacement, they provide superior benefits. Implants are stronger than natural teeth and generally last 10-20 years. They are also a more favorable approach than bridgework because they do not depend on neighboring teeth for support. Dental implants are an affordable, long-term solution. Let us restore the function and beauty of your smile.